Home » Challenges » Cushion Foundation Week 2 Day 4 : Laneige BB Cushion Whitening SPF50+ PA+++ Same but different! 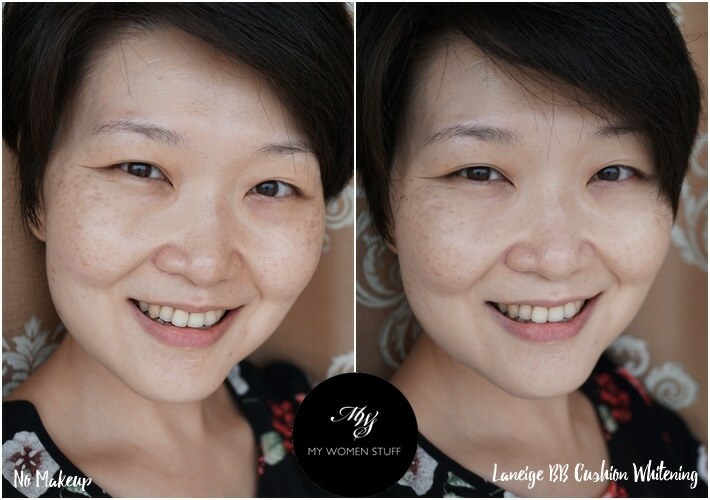 Cushion Foundation Week 2 Day 4 : Laneige BB Cushion Whitening SPF50+ PA+++ Same but different! Welcome, welcome to Day 4 of Cushion Foundation Week 2 (the K-Beauty edition) on My Women Stuff! For the uninitiated, you can view the brands featured in the first round-up of this nature and the others featured in this series, here. 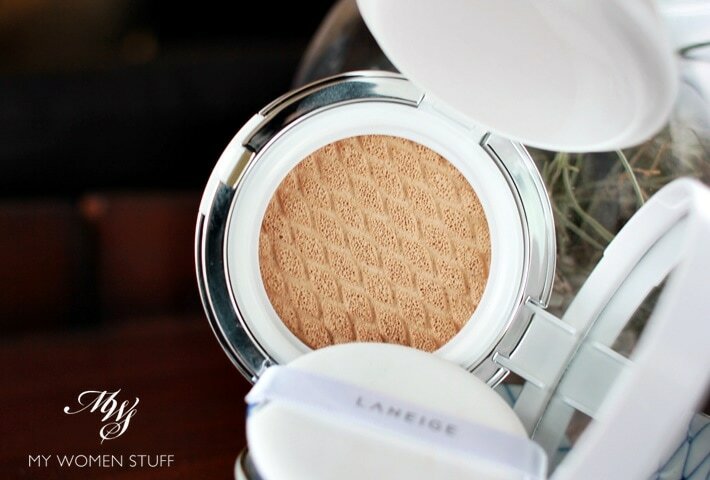 In 2016 Laneige unveiled their newest version of their popular BB Cushion. This one I’m showing you today is the Whitening version, which as the name implies, offers a more brightening formula. Apparently, Laneige has infused the BB Cushion Whitening with Sparkling Coat™ technology that infuses the product with pearlescent particles, and also Melacrusher, to help break down melanin and actually help with lightening dark spots. Skincare in a makeup, wouldn’t you know? What this means in simple English, is that if you want something dewy and glowy, this is the one you will be going for, because this is what it offers – a glowy finish on skin, as compared to the Pore Control version that offers a semi-matte finish. If you have both, how can you tell which is which? Well, you can tell from the case. The holographic center is the same, but you see the ring around it? The Whitening version is a pearly white-blue, while the Pore Control version is a bright, light blue. Like the other Korean BB Cushions I’ve featured so far, this one too uses zinc oxide and titanium dioxide as UV blockers. Mine was a press gift, and so came without a refill. However, when you purchase the actual product, the Laneige BB Cushion Whitening will come with a sealed refill and sponge. The design is similar to that of the Pore Control version, with the raised, textured sponge that feels rather firmer to the touch than normal. I must say however, that the sponge does seem to pick up product more evenly. I’m not sure if it’s to do with this 3D design, but whatever they’re doing, it works. 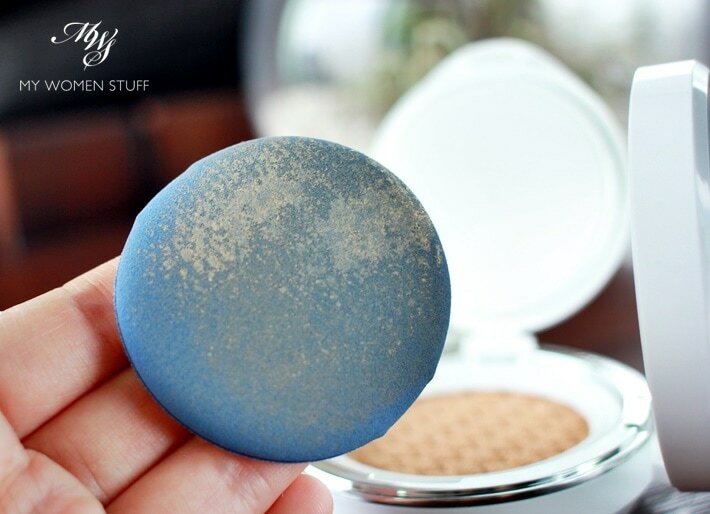 The Laneige BB Cushion puff has a blue base, and is springy but not too soft. These is a certain bounce to it, that I find important, because it is that bounce that helps apply the product to your skin more smoothly and evenly. You can see how a more used sponge puff looks as opposed to one that’s new. I do find that as time goes on, you do have to depress harder to pick up product, due to the firmness of the cushion. TO USE: Slip your fingers through the loop (it only accommodates 3 fingers for me so I find it a little small), dab the sponge on the surface of the cushion (you can see this is just 1 dab) and then dab it on your skin, in a press and roll motion. Press on skin, and roll it off. It helps the foundation adhere better to your skin. If you’ve been feeling a sense of deja vu reading this post, I don’t blame you. The packaging and construction of this BB Cushion is pretty much the same as the Pore Control version. But it is in the texture and finish of the product that the differences come in. 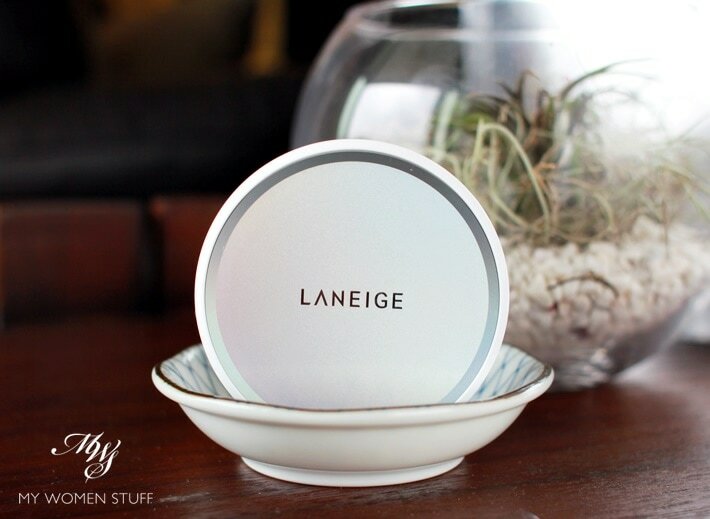 While the texture of this Laneige BB Cushion Whitening is lightweight, and feels almost like nothing on the skin, I find that this one feels tackier. So, when it goes on my skin, it doesn’t seem to set, unlike the BB Cushion Pore Control version. It is rather reminiscent of the Innisfree Water Glow Cushion, in that it remains feeling tacky on skin until I set it with a powder. You can’t see it too well in this before-after picture where I’m wearing the Laneige BB Cushion Whitening in Shade #21 Beige but you can see the coverage, which in my view, is lower than that of the Pore Control version. For some reason, I don’t find the Laneige BB Cushion Whitening to be very impressive when worn. I find the coverage very light, but it doesn’t seem to even out my skintone very much. This just seems like a more inferior cushion, compared to the Pore Control version, and I couldn’t quite understand why. In fact, I find every reason not to use this, while I’m quite happy using the Pore Control version. I tried using this trick for better coverage, but it didn’t look very good. I think, the base itself isn’t very good to start with, so for now, this one is, for me, just a wee bit better than the Innisfree Water Glow Cushion, because it is less tacky. Otherwise, I honestly wouldn’t bother with it, and would go for the BB Cushion Pore Control instead. The shade selection is impressive, in 8 shades – 13, 21, 23, 31, 33, 35 and 2 cool toned (pink based) shades 13C and 21C. Actually, no I don’t. If I had tried this one first, instead of the BB Cushion Pore Control, I would have sworn off Cushion Foundations forever. I’m glad I didn’t. This feels tacky on the skin, and gives it a shine that I dislike, and has very low coverage. I don’t like it. The Laneige BB Cushion Whitening SPF50+ PA+++ is a new version for 2016. The packaging has been improved, so it looks more sleek, and the cushion now sports a textured, patterned surface. I find that this one feels heavier on my skin and stays tacky for a long time. I also find that the coverage is very low, and it gives a glowy shine to the skin that I find unflattering in the heat and humidity. I do have normal-dry skin, and I think that anyone with oily skin might not like it much either due to the shine. I’m not enjoying this one at all! Have you tried either of the new Laneige BB Cushions? Which did you pick or prefer? I didn’t quite expect 2 cushion foundations from the same brand to perform so differently, but as you can see, they do. If I’d used this one first, I’d not have even bothered to try the Pore Control version. But I’m glad I tested them the other way around. This one, I cannot be bothered with, to be honest! Did you try this? hi im also using laneige bb cushion and we have the same onservation.its not good in covering the spots on my cheeks..we have the same blemish spots on both cheek.but i like its being lightweight on my face..i purchased it at Php 1950 with refill..may i know what product do u prefer using to cover the brown spots?thanks in advance ?? Hi, thanks for sharing your thoughts on this BB cushion. I usually use my regular concealer, which could be the Bourjois Radiance concealer, Urban Decay Naked concealer or my absolute favourite Nars Radiant Creamy Concealer. The Nars one is slightly thicker than the others, and it covers up best for me. Hi ! I just started using this bb cushion in shades 13 ivory. At first i thought my god I had purchased the wrong shades but when I apply it on my face,the texture blend well with my skin apart from it looks way too dewy on my skin. I expected a dewy finish as I am originally has a dry skin but then this is too dewy which I need to set it with powder. I absolutely likes how it makes my skin brighter and healthy but still I need a concealer to cover my dark circle. Maybe I should try the pore control version next time? How did you find the shades of pore control? Is it similar to this whitening one? Thank you.